The area is upland near Anglers' Retreat. 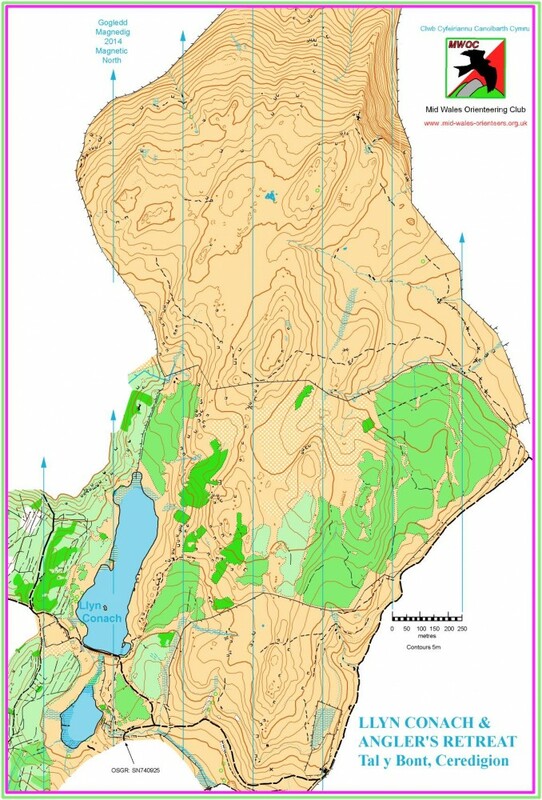 It is a newly mapped area for orienteering with extensive views into the distance from the higher vantage points as well as down towards the lakes and valleys nearby. Recent adjacent clear felling of trees has opened up the view on the approach to the area. There are plenty of contour features and a scattering of crags throughout. The northern section is completely open. It has not been well grazed and so is rough, this will give mostly slow running. The middle section is mostly slow run forest and open. It encompasses Llyn Conach and the smaller Llyn Dwfn. The smaller Southern open area is well grazed and fast running.